Gratitude is a powerful virtue that can have lasting and positive effects on our lives. Thankfulness shouldn’t be saved as a once-a-year effort but should be incorporated as a practice in our daily lives to reap the many benefits. Gratitude can be a tool for a healthier, more productive life. Overwhelmed caregivers of an aging parent may not feel particularly thankful every day. They may be stressed juggling the demands of career, caring for a parent and raising a family. But gratitude can change your perspective on life and help you better manage your stress. First, let’s define gratitude. Gratitude is a powerful human emotion. It is most simply defined as being thankful for what one has, but it’s not just saying a half-hearted “thanks.” For our definition of gratitude to be used as a caregiving tool, we are talking about deep appreciation that comes from within and in a meaningful way. It’s a state of mind with a readiness to show appreciation and return kindness. 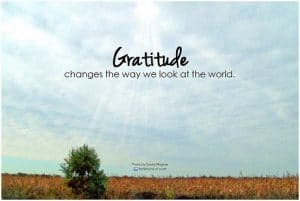 Gratitude has been getting a lot of attention lately as a key element in positive psychology—the scientific study of what makes life worth living and how to help people have a fulfilled life. Research has shown that counting your blessings and cultivating a practice of gratitude in your daily life increases your sense of well-being, happiness, and improves your health. And the expression of gratitude to others, like your parent or spouse, can increase your energy level and improve your optimism. Science is proving that gratitude can fundamentally enhance your quality of life—something we can all benefit from. Because you are expressing gratitude, it has a social aspect. You are engaging with others in a positive way. It is easy to see that socially you can benefit by feeling less isolated and interacting with others can boost your self-esteem. Thoughts of gratitude have been proven to increase your serotonin levels in the body. Low serotonin has been known to trigger feelings of loneliness and sugar or carbohydrate cravings that can lead to emotional highs and lows. Grateful people experience fewer aches and pains, tend to exercise more and report feeling healthier. Those who express gratitude have shown to have less chronic inflammation which has proven to contribute to heart disease and dementia. They benefit from a boost to their immune system, increased energy levels, and even sleep better and wake up more refreshed. Dopamine, serotonin, oxytocin, and endorphins are released with expressions of gratitude, so we experience more joy and pleasure. It can help us better cope during the hard times with greater resilience and mental strength. Gratitude can be a natural antidepressant and a great way to avoid the use of medications and create positive feelings of contentment. How do I cultivate gratitude in my life? Each day, set aside time to write down your top five positive things, people, or moments that you are grateful for, in a designated journal. Many people tend to do this before going to bed to help them unwind and sleep better. It may seem like a simple exercise, but it can show you that even during difficult times there is always something to be grateful about in your life. A gratitude journal also provides a comforting reference to look at when you need to be reminded about what you are thankful for. As a caregiver, you will experience good days and bad. Focus on the little things that you can be grateful for. This will direct your thoughts toward what is good and positive, and away from the negative. This will help you make gratitude a habit in your life. Meditation has proven to have great benefits to those who practice regularly. We suggest that you include time after meditation to practice gratitude. Another option is to practice mindfulness where you sit quietly daily and reflect on the five to ten things that you are most grateful for. After only eight weeks, studies have shown that brain patterns change by practicing gratitude leading to greater happiness and empathy. Gratitude is not only exclusive to positive events, but gratitude can be found in the obstacles that you work through or overcome. We can all learn from tough times that in the end make us more resilient. We can learn to approach the next challenge differently through our experiences. And you might find that you are tougher than you think. These are gifts that we can be thankful for. No better time to start than the present: what are you thankful for today? Visit the Aegis Living community near you and ask about our Gratitude program.